The objective of this set of worksheets is to coach high school students in the special series. Master your skills in evaluating special series consisting of natural numbers, even numbers, odd numbers, their squares and cubes. The answer keys provide instant validation. 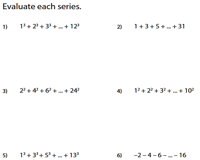 Special series is introduced with this set of worksheets focusing on using the summation formula for the natural numbers, their squares and cubes to evaluate the series. 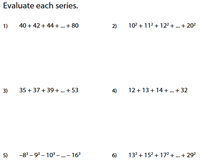 With an increased level of difficulty (first few terms are missing), this set of worksheets aims at finding the sum using the formula for a series consisting of natural numbers, squares and cubes. 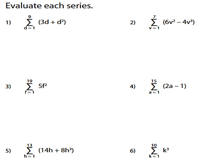 This collection of special series worksheets has exercises expressed in the summation formula with 1 as the starting index value. Substitute the values and evaluate to find the sum. The bar is raised with this set of worksheets where the initial index value is more than 1. Find the sum by plugging in the values into the formula. 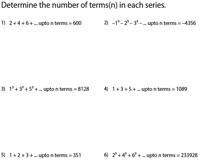 Implement this set of special series worksheets to provide ample practice in finding the number of terms in a series that add up to a given sum. The series is denoted in summation notation. 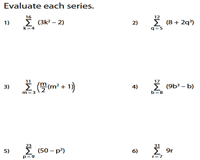 The sum of each series is given. 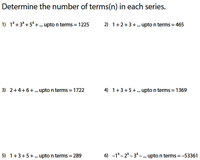 Find the number of terms (n).